CyberMatrix In Out Scheduler is agroup attendance management program that shows which employees are not present and at when they will return. It is an ideal solution for those companies wishing to replace their old-fashioned In/Out scheduling board. 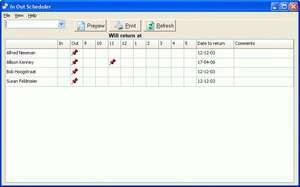 In Out Scheduler was designed to provide an effortless transition for those accustomed to the traditional scheduling boards. For security reasons, you should also check out the CyberMatrix In Out Scheduler download at LO4D.com which includes virus and malware tests. Additional screenshots of this application download may be available, too.